The audiograms of fifty-seven musicians from four Danish symphony orchestras were determined in connection with an interview about their working experience. Measurements of sound levels and noise dose were performed during rehearsal and during concerts in the four orchestras with the measurement equipment placed in various instrument groups. The average audiogram showed a decrease at higher frequencies similar to an age-related hearing loss. 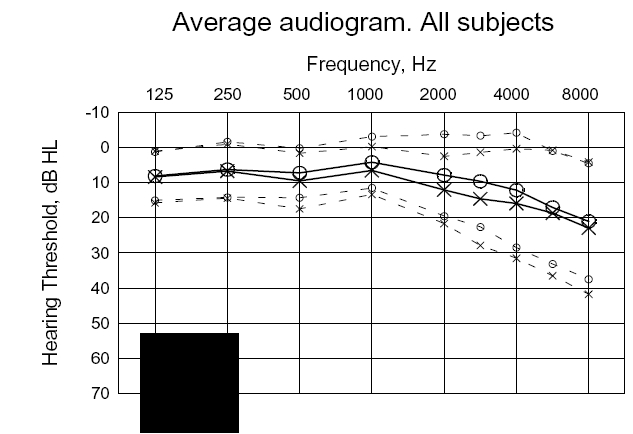 Each audiogram was corrected for the age of the person by means of the median from ISO 7029 and the average audiogram from these age-corrected individual audiograms showed no signs of hearing loss. The audiograms were also compared to the expected audiograms from ISO 1999, which takes account of the number of years at work, the number of playing hours per week, and the average sound level in the orchestra for the instrument group. In almost all cases the measured audiograms looked better than the predictions from ISO 1999. It may be concluded from this investigation that musicians cannot be expected to get pronounced audiometric hearing losses from playing in a symphony orchestra. It should be noted, though, that the data material is limited, and that the subjects have not been selected in a systematically or representative way. It has been suggested that otoacoustic emissions, particularly transient-evoked otoacoustic emissions (TEOAE), might be more sensitive in assessment of changes to the cochlea caused by noise than pure-tone audiometry (PTA). The aim of the study was to compare temporary threshold shifts with the changes in TEOAE following a six-hour exposure to industrial noise at the intensity of 85-97 dB (A). Thirty two male employees of a metal factory were screened. 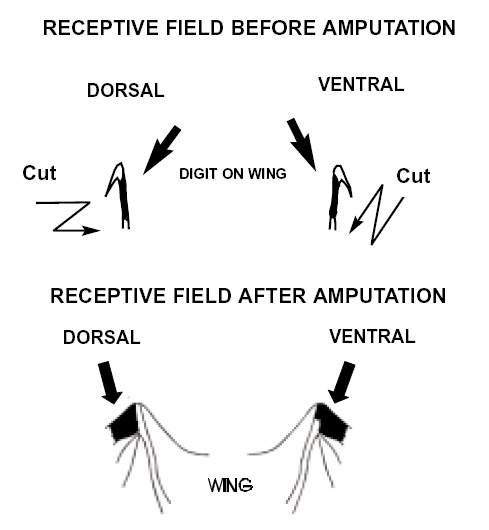 TEOAE, PTA and tympanometry were included in the hearing test battery. 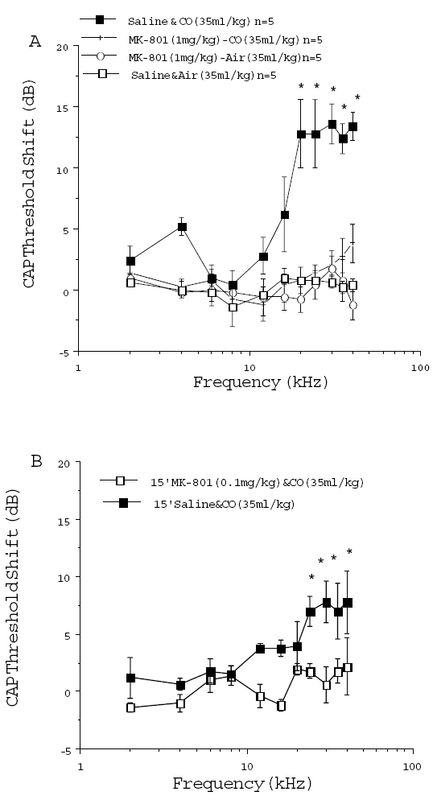 Both, PTA and TEOAE showed significant reduction due to noise exposure, but no correlation between temporary threshold shifts and decreases in either the overall TOAE level or the level of otoacoustic emission in the frequency bands was found. Our results confirm the high sensitivity of TEOAE to short exposure to industrial noise. This study may recommend this measurement as a method of evaluation for TTS conditions for hearing conservation programme purposes, in addition to pure-tone audiometry. 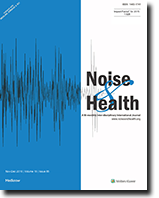 Otoacoustic emissions and contra-lateral sound activated efferent suppression of emissions were examined to determine whether they provide any early indication of auditory damage from exposure to noise. 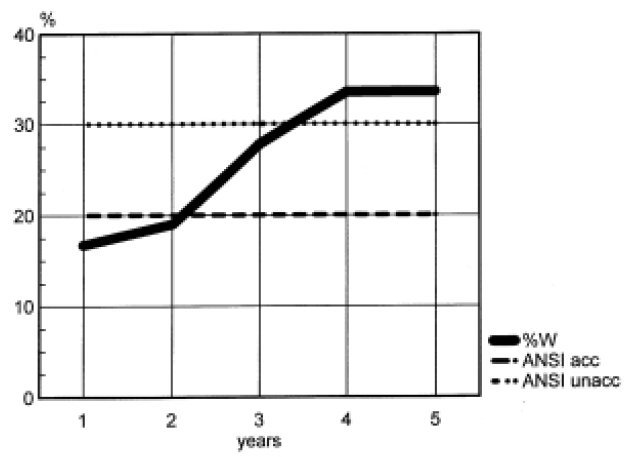 Three groups were studied: noise exposed workers (n=50, mean age 42 years), patients with Meniere's disease (n=24, mean age 48 years) and normal subjects (n=24, mean age 41 years). All subjects underwent routine pure tone audiometry, tympanometry and otoacoustic emission testing. As a number of studies have shown that with hearing threshold better than 30 dB HL, emissions are almost always present and are generally absent with hearing loss greater than 30 dB HL, subjects in this study were sub grouped into these two categories in order to examine the incidence of emissions. Absence of emissions in subjects with mean hearing thresholds better than 30 dB HL varied from 0% in normal controls, 8% in patients with Meniere's disease and a significantly high 56% in noise exposed workers despite similar mean hearing thresholds for all groups. The mean transient emission levels for the noise exposed workers was significantly lower than the controls and Meniere's groups. This study clearly indicates that in the noise-exposed group there is sub clinical and sub audiometric damage to the outer hair cells responsible for generation of otoacoustic emissions. Of those with normal otoacoustic emissions, the efferent suppression was absent in 60% of noise exposed workers but in only 3.8% of control subjects implying that the efferent control may also be affected in a significant proportion despite normal hearing thresholds and emissions. Gender differences in coping strategies and self-rated disability and handicap were explored in individuals with noise-induced hearing loss. The study group consisted of 60 male and 33 female patients, consecutively presenting at the hearing clinics in two hospitals in the western part of Sweden. The females were older and had worse average hearing thresholds over the low frequencies (0.5, 1 and 2 kHz) in the better ear than the males. However, all subjects rated their hearing loss as "moderate" to "severe". The patients responded to the Communication Strategies Scale, CSS, measuring "maladaptive behaviour", "verbal strategies" and "non­verbal strategies" and the Hearing Disability and Handicaps Scale, HDHS, which is composed of four factorially derived subscales: "speech perception", "non-speech sounds", "interpersonal distress" and "threat to the self-image". Pure-tone audiometry and sociodemographic data was also assessed. Despite differences in pure-tone audiometry, there were no significant differences between gender in perceived disability or handicap. Significant gender differences in coping were found. The women used "maladaptive behaviour" and "verbal strategies" significantly more often than the men. This is in agreement with results of an interview-study of women with NIHL, showing that the perceived emotional temperature in a specific situation guided the choice of coping strategy. The gender difference in coping could also be related to, and explained by, the conversational goal (transactional or interactional).